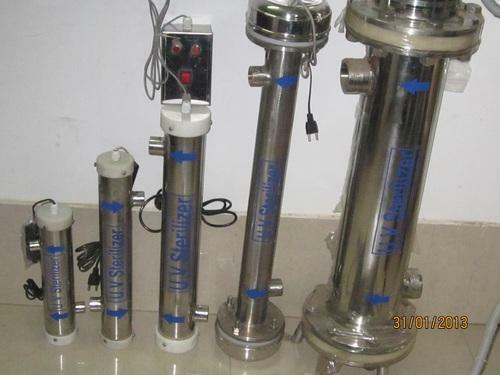 Our company is counted as the reputed manufacturer, exporter and supplier of an extensive collection of Ultraviolet Water Sterilizer System. This sterilizer system is obtainable in several specifications as per the variegated demand of customers. Offered sterilizer system does not add any harmful by-products like undesirable color, odor & taste. The sterilizer system offered by us is availed at nominal prices within a stipulated time frame. We are a leading manufacturer and exporter of superior quality AdwynUV Sterilizers. These products can be retrofitted into an existing chlorine contact tank and are much better in performance than the chlorine disinfection. Our offered product is an effective disinfectant and does not produce any disinfection by-products. These are manufactured under the strict supervision of our quality analyzers to ensure their compliance with international quality standards. Looking for “UV Sterilizers ”?